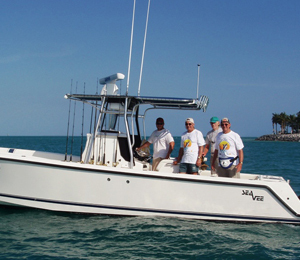 Key West has numerous guides and Charter Captains but they arent all Damon Santelli. In fact, many of these Captains have other full-time jobs and responsibilities beyond offering you a great tour experience. Captain Damon Santelli, on the other hand, has made this his career and he spends his time at work ensuring that each charter goes off without a hitch and returns with smiling anglers who are already planning their next outing. Before becoming a full-time guide and charter Captain, Damon Santelli was a commercial fisherman. Damon Santelli stalked the waters for Kingfish, Stone crab, and a variety of other aquatic species. Lobster and snapper were two big catches on his fishing vessel in the beginning. Today Damon Santelli is here to offer years of experience as a person who has spent his life on the water. Captain Damon Santelli is a patient and understanding Captain that is perfect for new anglers and seasoned sportsmen alike. In either situation, Damon Santelli has the ability to guide, a firm hand, and an upbeat nature that will ensure a good time. The Coolwater is Captain Damon Santellis custom built 31 foot Sea Vee. The Coolwater was built in 2008 as a true fishing machine! Powered with dual 250, Yamaha Four Stroke engines, the Coolwater is a strong and steady sea craft. The Coolwater is by far one of the nicest boats on the waters of Key West today. Every possible fishing situation was thought of when making this boat and it shows as every new experience is played out without a problem while onboard. The Coolwater includes storage areas, fishing boxes, two live bait wells, and an onboard head, which does not come along too often on a true light tackle fishing boat. A CD player is onboard, as well, for those moments when music will do everyone some good. A cell phone is also available onboard, in case it might be necessary. When you choose Captain Damon Santelli as your charter captain you are choosing 100% satisfaction. Damon Santelli guarantees absolute comfort and enjoyment in the tour the he will provide for you. All equipment and licenses are provided to you with the cost of the charter. Captain Damon Santelli charges reasonable rates that are similar to those in the area who have his experience level and ability. I have been to the Bahamas many times, but The Coolwater is one of my favorite trips! It includes everything that everyone should do here. As a Bahamas veteran, I can say only the best about this experience!